Andrei Tarkovsky’s Andrei Rublev (1966) is a film I always put off watching due to its gargantuan runtime – this being 3 hours and 25 minutes in its original cut. As an understatement, this film is a time commitment, but it has always been intriguing to me. So naturally, I had to add it to my Blindspot series for 2017. And also naturally, what would be the best day to watch this film? New Year’s Day, of course, to start 2018 off right (with a mild hangover). Was this a good choice? Yes. Andrei Rublev is an absolute masterpiece. Telling of the life of the artist Rublev himself in distinct chapters, each with its own intertitle card, not once does it feel slow despite the aforementioned extreme runtime. Each and every scene feels important in telling the overall story of a man’s life and commitment to his art, and is itself artfully captured by Tarkovsky. The script is filled with musings on God, life, art, existence during medieval times, and Russian culture at the time. It feels so full, and yet you’re not drowned in symbolism or patronising ambiguity. The story is congruent, and told well. On the surface level, Andrei Rublev looks like a semi-biographical story about a revered artist. However over its runtime, it becomes apparent that the film seeks to communicate themes such as artistic integrity, making art under the thumb of those in power, the pervasiveness and impact of religion on daily life and functioning, the suspect politics of medieval times, and many more. It made me wonder if Tarkovsky was actually talking to himself in communicating this story – undoubtedly, making his kind of films in the Soviet Union would have been a huge struggle, given that issues around censorship and needing to align with nationalist policy were prevalent amongst the art and film output during this time. There is a palpable sadness in this film that’s difficult to place, however. It may lie in Anatoli Solonitsyn’s performance. Solonitsyn also worked with Tarkovsky on Solaris (1972), The Mirror (1975), and Stalker (1979). Tarkovsky himself described Solonitsyn as his favourite actor, and it’s not hard to see why; as the titular Andrei Rublev, with his pure ability to show psychological depth and intensity without stating one word, he commands attention at all times amongst the quite complex composition in many of the film’s shots. This sadness may also lie in Tarkovsky’s characteristically beautiful and progressive directorial style, which seems curious, gently wondering about the state of mind of his characters, yet can be also somewhat impulsive and quirky. It is actually surprising and amazing when considering that this is Tarkovsky’s second feature film as a director. The black and white cinematography by Vadim Yusov is lush and gorgeous. The film is visual poetry. 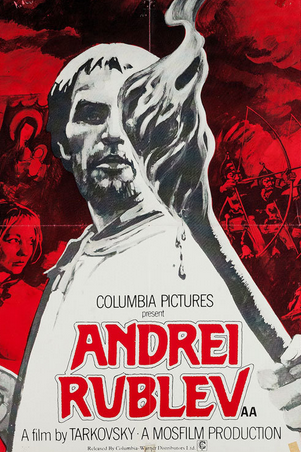 Andrei Rublev is also surprisingly violent. There are numerous battle scenes choreographed in a fairly brutal manner, plus some torture scenes for good measure. I was disturbed to see a real, live horse falling down a flight of stairs on camera and being subsequently speared to death – I was not expecting this and was sickened by it, having no idea that the film contained this scene. Apparently the horse was purchased from a slaughter house at the time and was going to be killed anyway (and was sent to an abattoir for commercial consumption afterwards), but viewers who don’t like seeing animal cruelty on screen should be warned. However, I was also touched by some of the more grotesque scenes. There is one moment where, following a battle with the Tatars, a girl named Doruchka is seen to be lying on top of the body of a dead woman, braiding her hair. This moment struck me as being so sad. You can trust Tarkovsky to create something touching out of something so upsetting and violent. Andrei Rublev doesn’t shy away from how horrible living in medieval times must have been, in fact, this is displayed in front of our faces the whole time. Without spoiling anything, I was moved to tears at the end of this film. And I don’t think it was because I watched it on New Year’s Day with a mild hangover. I was so overwhelmed with my commitment to these people and their art that I almost didn’t want the film to end. The film is heavy-going, with cultural references from the turbulent time period of medieval Russia, which occasionally warranted a quick research on Wikipedia in order to keep up (for example, what is a Boyar?). But I was so entranced by this film that I would consider it a learning experience. As aforementioned, Andrei Rublev is a masterpiece – a work of art about a revered artist. If you have the time for it, this is essential viewing. This was the final post for my Blindspot series for 2017! See the rest of my Blindspot films here. That runtime has kept me away, too. I keep telling myself I’m going to tackle it one of these days. Your proclaiming it a masterpiece helps move me in that direction. Still not sure how quickly I’ll get there, though. Yeah, it’s a somewhat daunting runtime, but it was so worth it. Escalate it on the watchlist for sure! Isn’t this film spectacular? I think you’d like Aleksei German’s mind-blowing Hard To Be A God (2013), which is based on a sci-fi novel by by Arkady and Boris Strugatsky. It’s also an epic in length and pretty brutal, but it’s one of those films that grabs you right from the start. Love the recommendation – I’ve popped it on the watchlist! Sounds super intriguing.